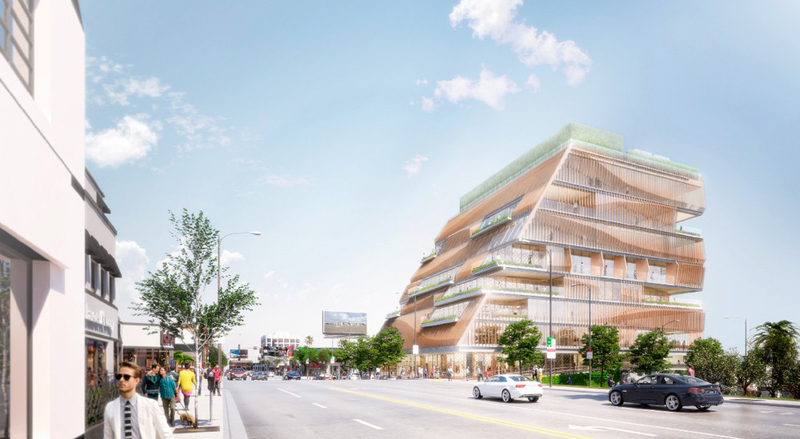 The London-based Arts Club’s new Gensler-designed California outpost has won planning approval from the City of West Hollywood. The 132,000-square-foot mixed-use complex is partially backed by wellness impresario Gwyneth Paltrow and represents the latest members-only club establishment to take root in Southern California. The new arts-focused clubhouse will be located on the Sunset Strip on the site of the original Hustler store, one of the former mainstays of the district. 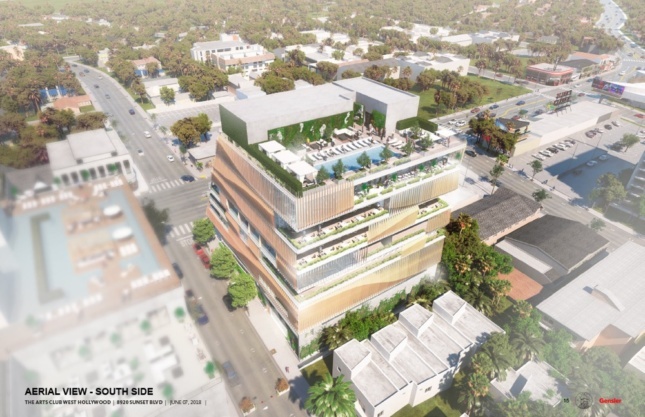 The proposed building is set to contain restaurants and a public art gallery on the ground floor, with private offices located on two of the floors above. The Arts Club facilities will be located on the uppermost floors and will contain private dining spaces, a movie screening room, up to 15 hotel rooms, and a rooftop pool. Renderings for the complex depict a dramatic structure that slopes into the site from the street edge, creating a semi-pyramidal building. The wedge-shaped complex is shown wrapped in vertical louvers with floor-to-ceiling glass-walled exposures located beyond the shading elements. A dining terrace on the third floor along the back of the building is set into the mass of the complex while a dual-level roof terrace steps back at the top floor to reveal a pool deck studded with cabanas. The Arts Club was originally founded in London in 1863 by cultural figures including Charles Dickens, Anthony Trollope, and Frederic Leighton. The private, members-only club also boasts a location in Aspen, Colorado. In recent years, a spate of members-only arts-focused clubs has spread across Los Angeles, with the Neuehouse opening at the nearby Columbia Square development in 2016 and a new outpost of SoHo House slated to open in L.A.’s Arts District in coming years. The Arts Club is headed toward construction with an anticipated 2020 completion date.